12x18 - Reflective Rust-Free Heavy Gauge Aluminum No Sunglasses At Night Sign. Many wear sunglasses for practical reasons: to protect sensitive eyes from the glare of direct sunlight or the light reflected off glass, snow, or water. Others wear them to make themselves conspicuous—and because many pairs are madly expensive, they also signify conspicuous consumption—in the movies, those who wish to seem hidden, such as spies and secret agents, often appear in sunglasses. Not to hide, but to make their secrecy stand out. As a public service, we have designed this high-quality reflective heavy-gauge aluminum No Sunglasses sign in the hope that they can be stopped in their tracks. We encourage every home, small town, school, dorm room and overpriced studio apartment in every big city to establish a rule of No Sunglasses at night. Due to heavy demand, please allow 2-3 work days to ship. 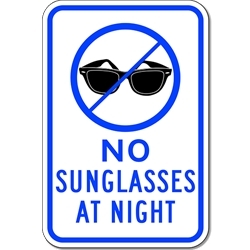 DOUBLE the working life of your No Sunglasses At Night Sign by adding 3M Protective Overlay Film (POF)! 3M’s high-tech POF protects sign faces against fading caused by the sun and harsh weather—and makes graffiti defacement damage easy to clear away without harsh abrasives.